WEST LAFAYETTE, Ind. – A new type of soft and stretchable sensor could find uses in applications ranging from athletics and health monitoring to prosthetics and virtual reality. 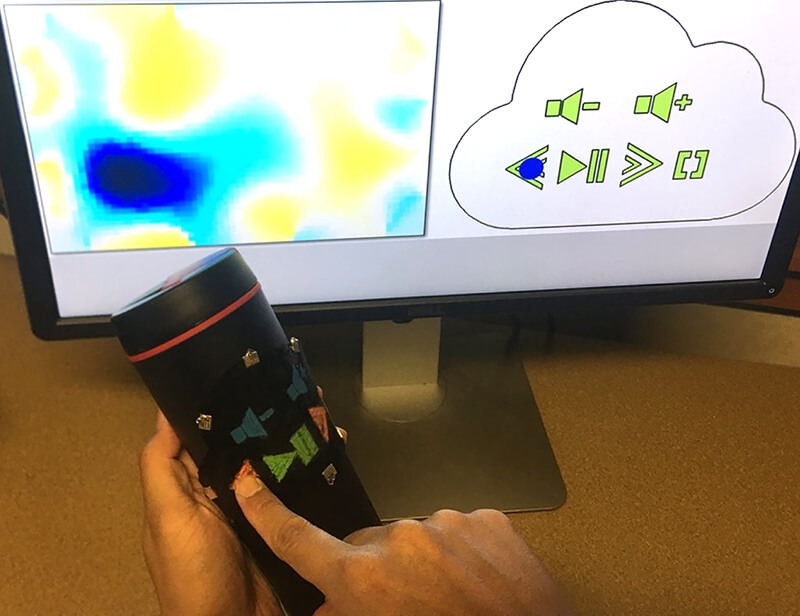 The technology, called iSoft, is capable of sensing in real-time, or without delay, and can perform “multimodal” sensing, or sensing a variety of stimuli such as continuous contact and stretching in all directions. Such flexible and wearable sensors are being developed to measure and track body motion, a task made more complex by the human anatomy’s numerous potential contortions. For a wearable sensor to work properly, it must be able to deform accordingly. Unlike some soft sensors developed previously, iSoft can handle continuous contact and also can be easily modified for custom purposes after manufacture. “By continuous, we mean moving on the surface and also pressing all the time such as drawing with a pen, which is difficult to achieve,” Ramani said. The sensor uses a “piezoresistive elastomer,” which when touched changes electrical resistance that provides sensing data. “We are proposing a low-cost, easy way to fabricate such piezoresistive-elastomer-based soft sensors for instant interactions,” he said. Research findings are detailed in a paper being presented during the ACM Symposium on User Interface Software and Technology (UIST), Oct. 22-25, in Quebec City, Canada. Purdue doctoral student Sang Ho Yoon will present the paper on Oct. 25. A YouTube video is available at https://www.youtube.com/watch?v=7fNbM-lrX-E.
Wearable technologies such as “smart” garments are an emerging market, as evidenced by recent Levi’s jeans and a jacket that connect with other devices and the Internet. The iSoft platform is promising for various applications, from artificial skin in robotics to health monitoring, sports medicine and tactile clothing as an interactive interface. The technology features an electrical impedance tomography - or EIT - technique to estimate changes of resistance distribution on the sensor caused by ﬁngertip contact. The system also uses an algorithm the team developed called a dynamic baseline update for EIT that compensates for “rebound elasticity,” which normally causes a signal delay while the elastomer returns to its original shape. These baseline updates are triggered by ﬁngertip contact and movement detections. The team validated the performance of contact and stretching sensing through a series of experiments and evaluations. The sensor is a thin, rubbery sheet with electrodes around the periphery. It harnesses a material called carbon-ﬁlled silicone rubber, a non-toxic piezoresistive material that has been widely explored in research for various types of low-cost sensors. “However, the limitations in interactions have been mainly due to a rebound elasticity of the material, which causes a slow-recovery of the sensing signals after material deformations,” Ramani said. The dynamic baseline update process solves the problem, while the electrical impedance tomography technique makes it possible to fabricate sensors in a “single-volume manner,” or using electrodes only on the periphery of the material, eliminating the need for invasive wires and sensors within the material. The paper was authored by Ramani; Yoon; doctoral student Ke Huo; postdoctoral research associate Yunbo Zhang; graduate student Guiming Chen; and doctoral students Luis Paredes and Subramanian Chidambaram. A patent has been filed by the Purdue Research Foundation’s Office of Technology commercialization. The work was partially supported by the National Science Foundation, National Robotics Initiative and an NSF IGERT grant in sustainable electronics. Note to Journalists: An electronic copy of the research paper is available by contacting Emil Venere, 765-494-4709, venere@purdue.edu. A Youtube video is available at https://www.youtube.com/watch?v=7fNbM-lrX-E. The video was prepared by Jared Pike, communications specialist in Purdue’s School of Mechanical Engineering, jaredpike@purdue.edu. We present iSoft, a single volume soft sensor capable of sensing real-time continuous contact and unidirectional stretching. We propose a low-cost and an easy way to fabricate such piezoresistive elastomer-based soft sensors for instant interactions. We employ an electrical impedance tomography (EIT) technique to estimate changes of resistance distribution on the sensor caused by ﬁngertip contact. To compensate for the rebound elasticity of the elastomer and achieve real-time continuous contact sensing, we apply a dynamic baseline update for EIT. The baseline updates are triggered by ﬁngertip contact and movement detections. Further, we support unidirectional stretching sensing using a model based approach which works separately with continuous contact sensing. We also provide a software toolkit for users to design and deploy personalized interfaces with customized sensors. Through a series of experiments and evaluations, we validate the performance of contact and stretching sensing. Through example applications, we show the variety of examples enabled by iSoft.